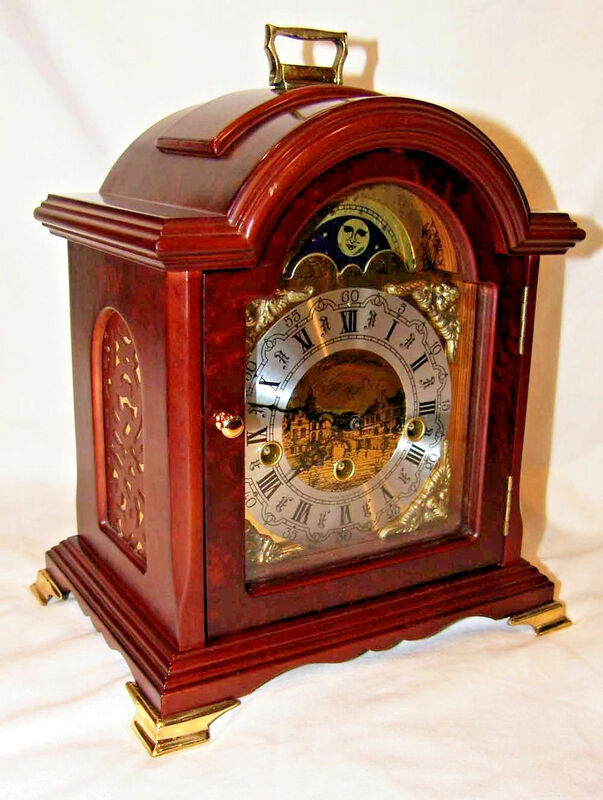 This clock is a vintage Westminster 4/4 Melody Striking Christiaan Huygens Shelf Mantle Bracket Moon phase clock. This clock is an antique and was made and designed in the Netherlands. This clock is in full working condition and strikes on the quarter, half, three quarters, and on the hour. The chimes go off according to the time and chimes a full chime and strike on the hour. The clock shows some sign of being used cosmetically but it is still in great condition. There is normal wear and tear but the mantle clock has a nice look and movement. The clock is almost in mint condition. This clock is an eight to ten-day movement clock and keeps accurate time. The height of this particular clock is 29 centimeters with a width of 24 centimeters, as well as a depth of 18 centimeters. The clock still has the original key that came with the clock. The clock has a beautiful design that will capture attention. The stain of the wood is a beautiful light brown color. 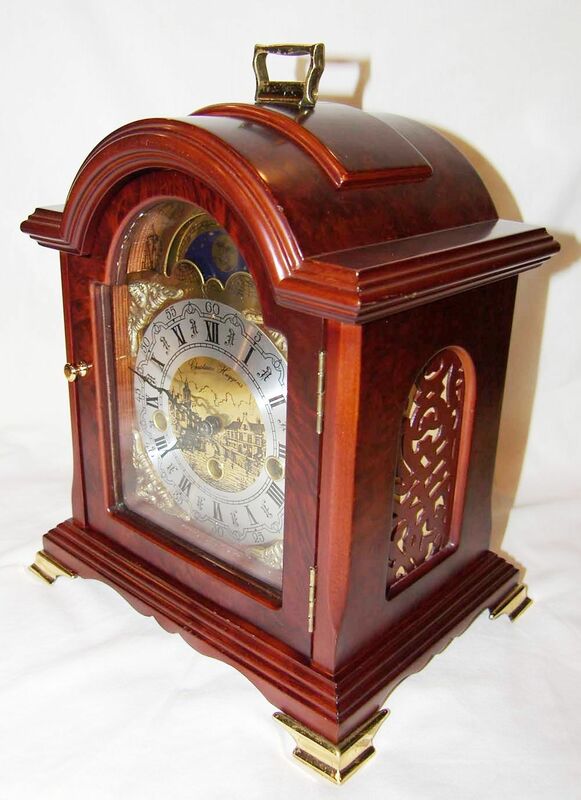 It has a beautiful grain to the wood making the clock a focal point. 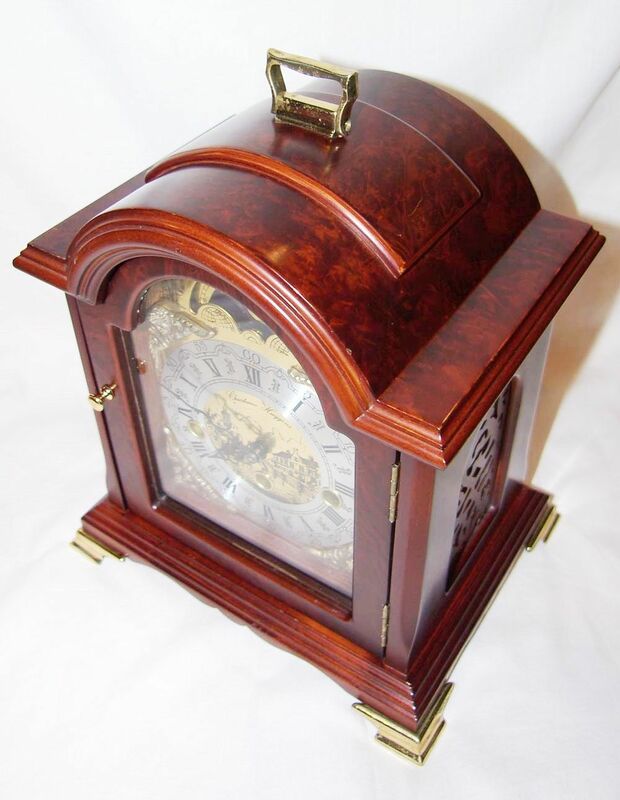 The clock has four legs that are a gold color which really compliments the brown of the wood. The dial of the clock is a silver color with black roman numerals. 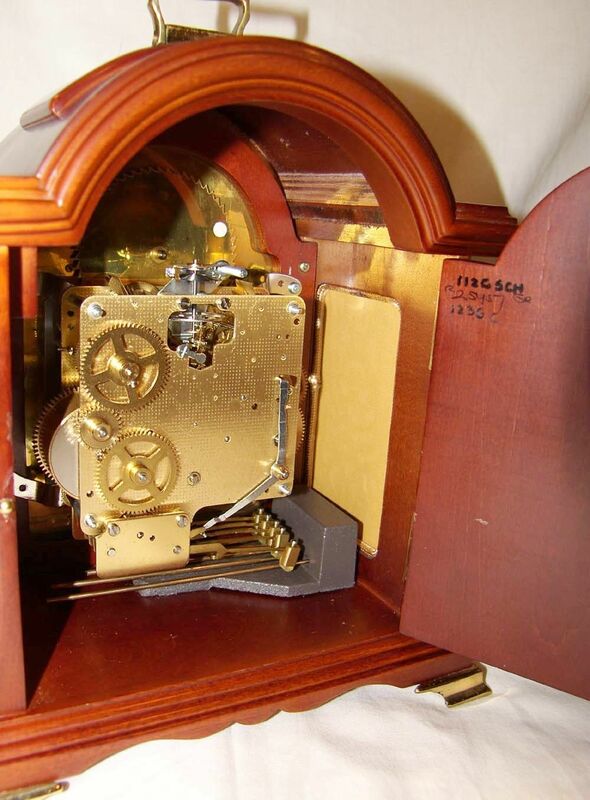 The dial of the clock is accented with gold to make the clock look more elegant. The center of the dial has a beautiful city that is painted on a gold background. The top of the clock has a beautiful navy-blue background surrounded with gold with a beautiful moon lighting up the night. This clock has a very sophisticated look that will capture the attention of any clock lover. This clock is an antique and is full of beautiful details. The gold accent on this clock makes this clock look more elegant. This clock is definitely an eye grabber due to its many beautiful details. The clock itself is beautiful and it keeps amazing time for being an antique.